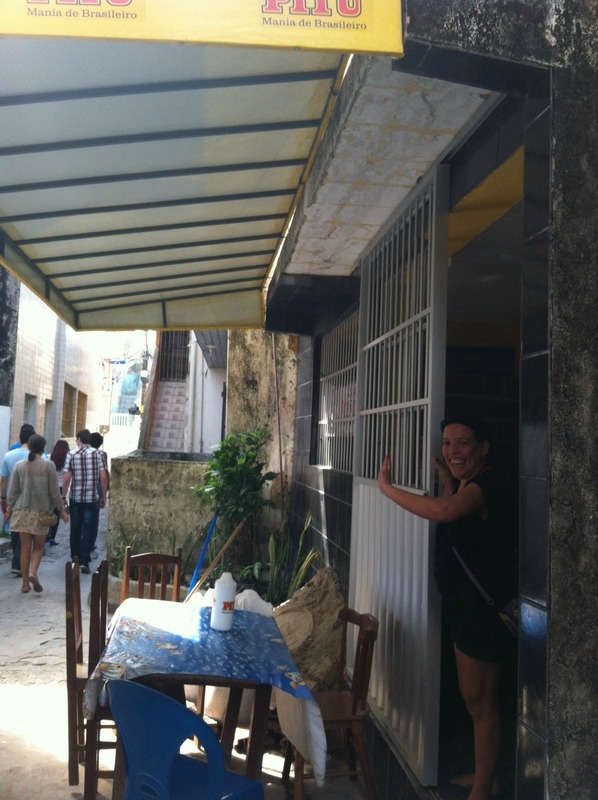 My first glimpse of Bar do Cabo in the favela town of Pina. Any good traveler knows that whatever city you may be visiting, if a local invites you to a meal at their favorite establishment you don’t ask questions. Just assume that they know what they’re talking about and enjoy the insider knowledge. That’s exactly what I did when an offer to eat lunch with some Brazilians from Recife presented itself. 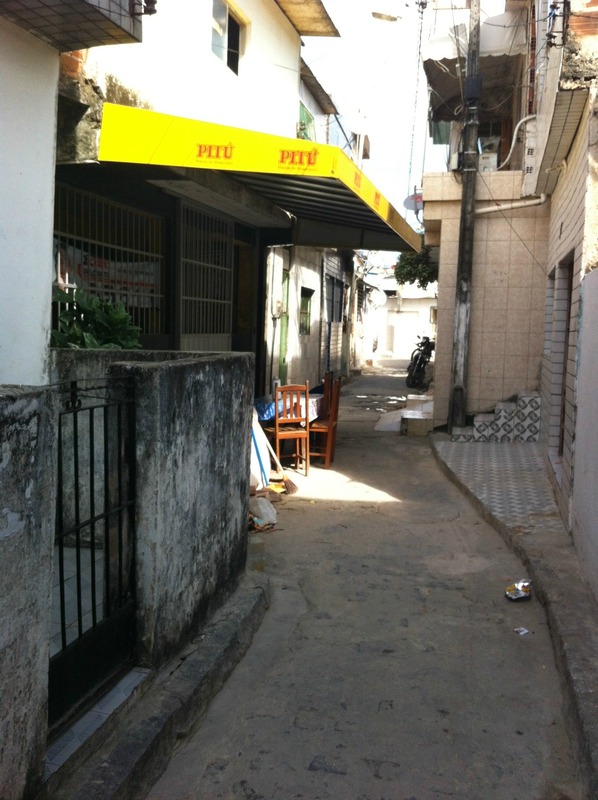 The fact that it was in a nearby favela (a Brazilian shantytown) called Pina only piqued my interest further. While I’ve lived several miles from Pina for the past three months, I have never entered the narrow dirt roads of rundown buildings and small alleyways. I’ve only looked with interest as my taxi passes by the entrance each morning. As I walked with my friends down Rua Nanuque, a road so small the only way to reach it is by foot, I wasn’t in fear for my safety at all. Instead, my mind was wondering about the condition of the place I’d be eating. Back home, I’m the type of person who is always on the lookout for the health department grade posted at the entrance of a restaurant. I knew that where I was about to break bread would be a pretty big leap out of my comfort zone. The entrance to Bar do Cabo. As I entered the small building of Bar do Cabo, the many awards hanging from the shabby walls offered some peace of mind. Surely, no one has died or gotten violently ill at a place voted “Best Beach Bar” several years in a row. In keeping with true hole-in-the-wall fashion, this restaurant has no menu. Whatever is being cooked in the kitchen is what you get, served family-style, of course. If you’re lucky that will include octopus rice. Reminiscent of the Spanish dish, Paella this seemed to be the most popular entree with the locals. 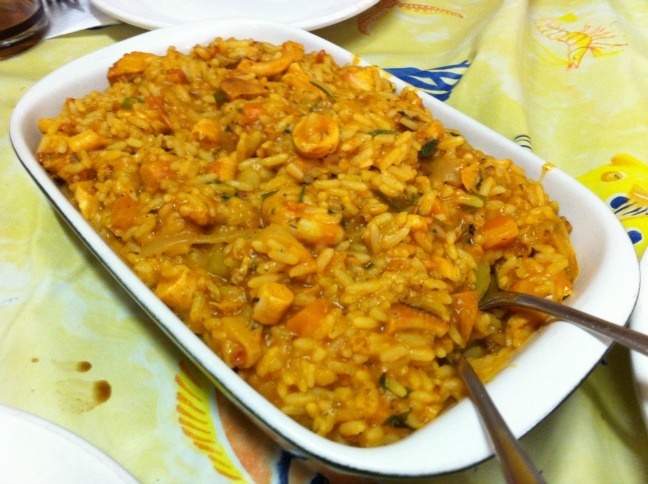 Seafood risotto with octopus and shrimp. In addition, we enjoyed shrimp in a coconut sauce and a lobster stew with potatoes and other vegetables. The food was so delicious and plentiful that I quickly forgot about my qualms and simply sat back and enjoyed both the atmosphere and the flavors. At the end of our meal a bowl of sweet, gummy guava candy was placed in the middle of the table. One of our hosts joked that he loved eating with foreigners because of the special treatment. Apparently, he’d never been given candy to end a meal. My instincts upon arriving to this tiny restaurant were to politely nibble a few small bites but I’m glad I didn’t. 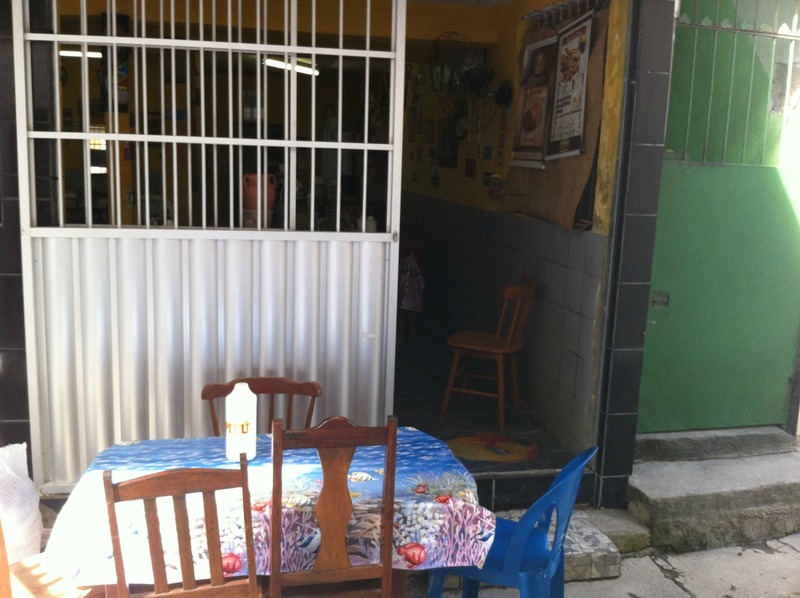 The food was great and I’ll never forget the meal that I enjoyed with great people on a small road in a Brazilian favela. The lesson is to take advantage of being in a new place by stepping out of your comfort zone. By doing this you have so little to lose and so much to gain. You never now what once-in-a-lifetime opportunities you may miss. Waving bye to the guests at Bar do Cabo.